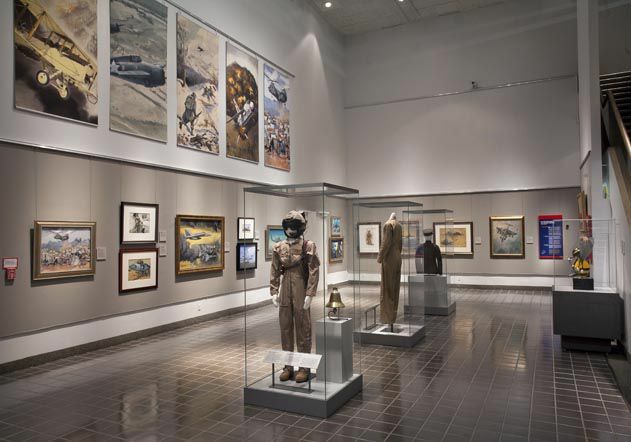 Art and artifacts from the Marine front lines, now on display in Washington. In the Naval Appropriations Act of August 1916, Congress provided $3.5 million for aircraft and equipment. The act also established a Naval Flying Corps of 150 officers and 350 enlisted men of the Navy and Marine Corps. By the end of 1916, 60 airplanes had been ordered, including 30 Curtiss N-9 seaplanes. Early in 1917, notes Marine Corps Aviation, The Early Years, while flying one of the N-9s, Captain "Cocky" Evans "made a major contribution to American aviation safety. He did it largely by accident. He and other pilots at Pensacola had been arguing about whether one could loop a tractor-type seaplane. Evans and others insisted they could, while their opponents contended the heavy, fragile pontoons would make the maneuver impossible. On 13 February, at an altitude of about 3,500 feet above Pensacola on a routine flight, Evans decided to try to loop. His initial attempt failed, and his N-9 stalled and went into a spin. No American aviator up to this time had worked out a method for recovering from a spin, and several had died in crashes as a result of this gap in their knowledge. Evans, apparently without realizing he was in a spin, instinctively pushed his control wheel forward to gain speed and controlled the turning motion with his rudder. Recovering from the spin, he kept trying to loop, stalling, spinning, and recovering until he finally managed to loop. To make sure he had witnesses for his feat, he flew over the seaplane hangars and repeated the whole performance. Not until then did he realize that besides proving a seaplane could loop he had solved a major safety problem. The aviators at Pensacola at once incorporated his spin-recovery technique in their training, and Evans was sent on a tour of military airfields to teach other pilots his method." 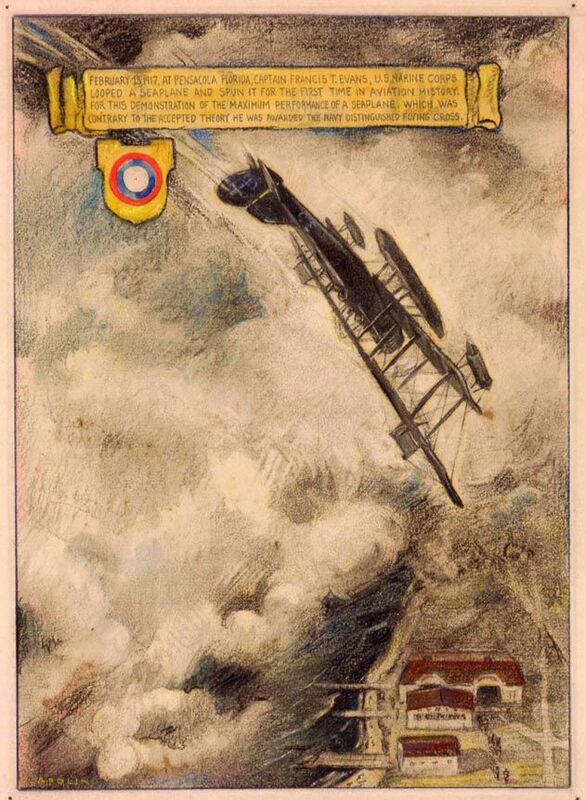 Lieutenant Colonel John Capolino captured this historic event in his 1930 pastel titled "Loop of Seaplane, 1917."